Nurse consultant for older people, Nicky Hayes reviews Excellent Dementia Care in Hospitals: A Guide to Supporting People with Dementia and their Carers. 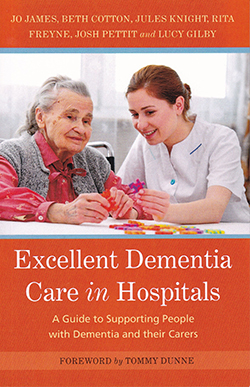 Specialist nurse Jo James and colleagues in the dementia team at Imperial College Healthcare NHS Trust share their expertise and profound understanding of the needs of people with dementia in hospital in this useful guide for nurses and healthcare assistants (HCAs). Individual case studies drive each chapter’s practical focus and person-centred approach, closing with pointers for registered staff and HCAs on how to make best practice happen. The chosen structure is highly effective in putting the person before the problem, and maintains a strong readability throughout. Accessibility is a strength of this book, although in a few places it has led to oversimplification and underuse of references. I would have liked to have seen full referencing for each chapter in place of an overall bibliography, and some further pointers to practical resources and online publications. Useful techniques such as validation and therapeutic touch are well covered and the chapters on communication, pain and end of life care are particularly strong. This book should be read by all nurses who care for people with dementia in hospital and by students who are preparing for hospital ward placements.